The NASC name the Hon Charles Pearson “as likely to have the most” snaring blood on his hands of any individual in the country. He has ignored correspondence – simply threatening injunctions via his solicitor. A major leafleting campaign will soon be underway to highlight his involvement – together with several planned protests. Anyone with any information on snaring (or any specific illegal practice), in which the Hon. Charles Pearson has responsibility (ie: where he owns the land or manages the shoot), should contact us immediately. Above: This badger found alive in a snare at Bepton, West Sussex (on a shoot managed by the Hon. Charles Pearson) in 2002 leading to the Cowdray Estate asking for all gamekeepers to attend a course of instructions on setting snares within the law. Lickfold, near Petworth, W. Sussex. Dunecht is known for its ruthless persecution of foxes, and its gamekeeper, Iain Freaks, tied in a “keepers sweep” competition for killing the most foxes in a day. 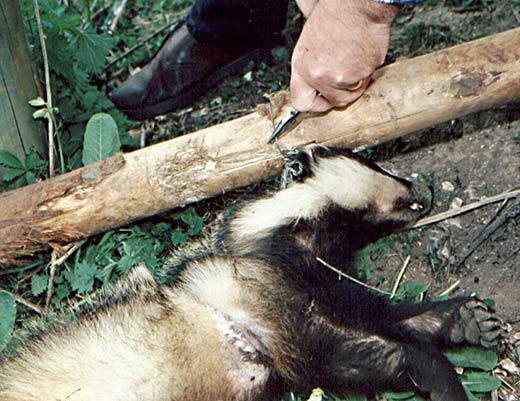 The West Sussex Badger Protection Group has a history of badger and dog snaring incidents on the Cowdray Estate going back 10 years – including a snared badger ending up in a garage toilet at Easebourne in 1998, and a dog and badger caught in snares at Ambersham Common in 1997. These incidents culminated in a badger being released from a snare at Bepton, Midhurst in 2002, where a gamekeeper received a formal police caution, and in 2003 when a snared badger was found to have been clubbed to death at Cocking, Midhurst. 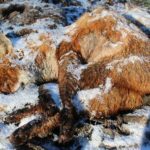 The latter incident was the final straw for Viscount Cowdray, as it followed the Bepton incident, which in itself had resulted in all the estate’s gamekeepers being forced to attend a course of formal instruction on how to set snares within the law. 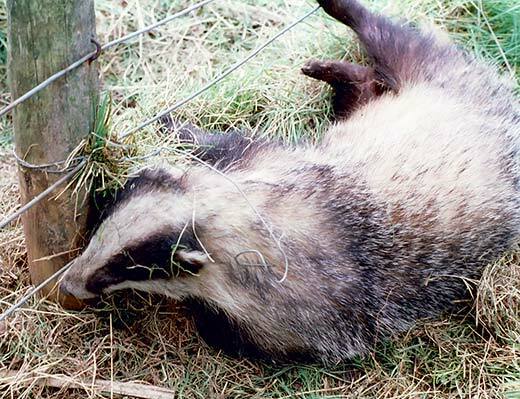 The final straw: this snared badger had been clubbed to death at Cocking, West Sussex on a shoot managed by the Hon. Charles Pearson in 2003. On 10th December 2003, a letter was sent to all shooting tenants on the Cowdray Estate from R.A. Windle, (Cowdray Estate manager) asking for “all snares to be removed immediately from all Cowdray estate land.” We believe that Hon. Charles Pearson was unhappy about this and at odds with his elder brother Viscount Cowdray) who owned the estate. 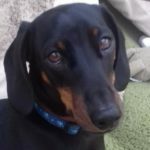 August 2002 – Cat comes back from Bisset Wood with broken lower jaw and two missing canines. August 2003 – Cat goes missing after a single shot is fired in the evening. The cat was never seen again. snares. On 26 April 2004, another badger is found snared by a syndicate member. This one is released alive with assistance of a local vet. Above: The badger found by Trinjnie on the Hon. Charles Pearson’s Dunecht Estate in April 2004. Pressure is now being put on the Hon Charles Pearson to see that all snares are removed from his Scottish Estates, given the catalogue of snaring carnage that has taken place on the shoots with which he has commercial interest, or receives rental income. 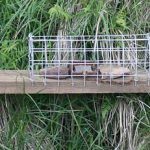 Most of the major landowners in West Sussex have now asked all their shooting and farming tenants to remove all snares. Lord March of the Goodwood Estate, near Chichester, banned all snares on his land in 1996 following several snaring incidents which included a conviction of a gamekeeper in November 1993 for shooting a snared badger, and another incident in 1996 when a badger was strangled in a snare (a post-mortem showed the badger also had suffered serious injuries from another snare a year before). 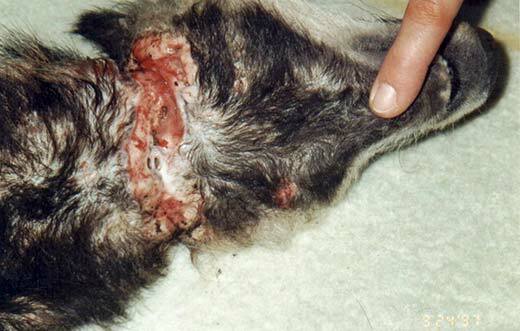 The final straw for the Goodwood Estate in 1996: This badger was strangled by a snare and shows the year old snaring injury around its middle. Viscount Cowdray of the Cowdray Estate, Midhurst bans snares in December 2003 following several snared badgers on his land. April 2004: Lord Egremont of the Leconfield Estate, Petworth has followed the lead of the Cowdray and Goodwood estates, and has also agreed not to set snares anymore: follows an agreement with the W. Sussex Badger Protection Group. 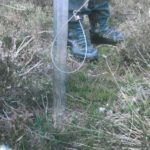 Mr Rober Jenner of Home Farm , Milland, West Sussex asked for all snares to be removed from his land after a gamekeeper ignored a warning relating to his use snares from an RSPCA officer in 2002, and went on to receive a formal police caution in 2003 for snaring offences. The snares were also set close to known badger setts. In 2001 snares were removed from a large area of Chilgrove, West Sussex following police advice after veterinary Surgeon, Nick Thompson found his cat lucky to be alive when it returned with a snare around its body. And snares were removed from land at Lodsworth in 1999 after badgers were snared on land near Leggatt Hill Farm, Lodsworth between 1997 and 1999. 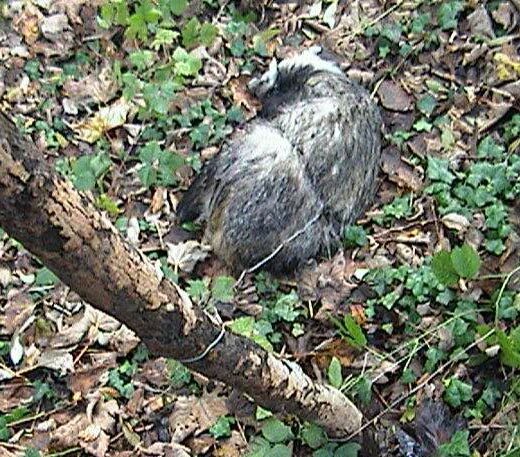 This badger found alive, had been scalped and strangled by a snare at Lodsworth, West Sussex.